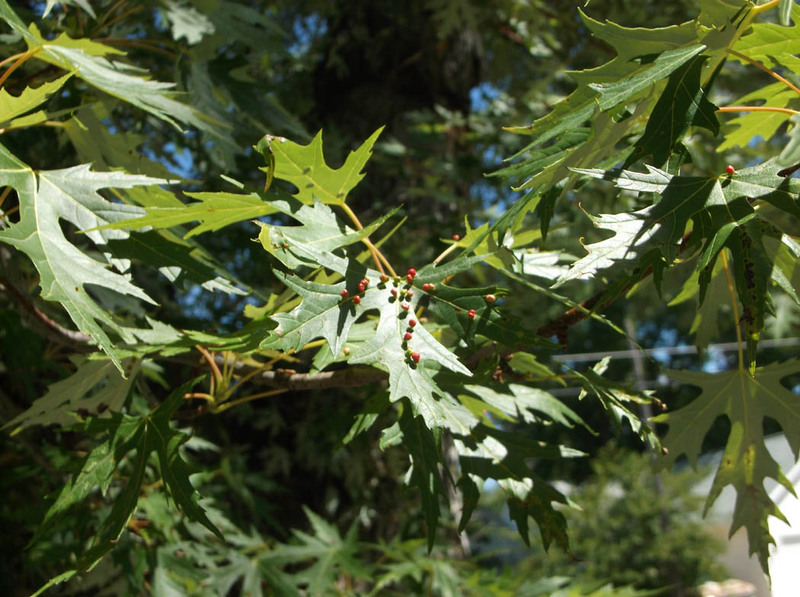 In early summer you may have noticed small pouches on red and silver maple leaves. If you open one up, you will find—nothing at all. Or so it seems. In fact, the creatures that live there are swarming all around. They are microscopic mites of the eriophyid family, so small you would need a 400X magnification to study them in detail. Unlike most mites, they have but four legs—not eight—with two pairs clustered around the animal’s mouth. Dwelling within such a small space, eriophyids hardly have need of legs at all: for most of their lives their universe is no bigger than the gall they inhabit. The life cycle of the mite is simple. They mate and reproduce within the secure enclosure of the gall, producing several generations within a summer. Before leaves change color in autumn, obeying a signal we do not know, they migrate out of their chamber to the bud scales of next year’s leaves or to protected areas under loose bark. Dormant, they wait there for the cold blast of winter. In spring, before leaves expand, they enter young leaves on the underside, their presence initiating the balloon-growth of many pouches, the number ranging from a half dozen or so to an ugly multitude that deforms the leaf. While the mites undoubtedly sap energy from trees, they cause little permanent damage. Gardeners and foresters generally ignore their presence, not wasting effort or chemicals to discourage them. Maple Bladder Galls on Silver Maple, Traverse City. I think leaves adorned with crimson maple bladder galls are attractive, resembling miniature Christmas decorations in the month farthest removed from that holiday. They can be pointed or inflated depending upon the species of mite involved and colors vary, frequently starting off green and becoming red before fading to a dull brown. Can they be thought of as a rash trees get? Not exactly, since they do infect the surface tissues alone, unlike human dermatitis. Another kind of eriophyid attacks plants in a different way. Instead of making galls, it secretes a chemical that induces plants to grow a forest of slender hairs called an erineum. 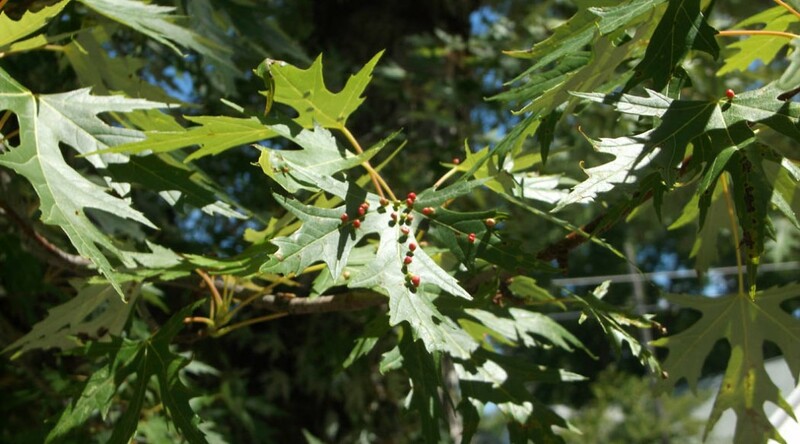 An erineum—taken from the Greek word for fleece—can be found on the lower surface of leaves of many plants: oaks, maples, viburnum, and grapes are especially affected. It may appear as a velvet fuzz, white or commonly red in color. As with the gall-forming eriophyids, the erineum mites are exceedingly difficult to see even with a powerful magnifier. A twenty-power lens might reveal their presence, though sharp eyes will be called for. A microscope, of course, would work better. Somehow I connect these animals with larger herbivores like bison.. I imagine them roaming over the fields of hairs they caused to grow, feeding upon them as the bison would, a prairie in a square inch. Throughout early summer they graze, finally retiring to bud scales and bark for the winter. Occasionally a stiff wind will blow them right out of the erineum, something bison do not have to worry about. Of course, the advantage for the mite is that it might get blown to a new tree, fertile ground to establish a new miniature prairie ecosystem. Nature performs its work at every scale: planet, ecosystem, organism, organs, tissues, and cells. Isaac Asimov, the famous science fiction writer, once wrote about exploring the world extending from his backdoor. After much study he had gotten as far as a few feet from his porch, so numerous were the species he encountered. 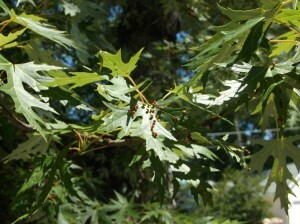 Most likely he did not get around to the mite-formed galls or erineums on his shade trees. Richard Fidler is a retired teacher of biology, a Traverse City historian and an editor of the Grand Traverse Journal. Where is it? What is it? When was it? Can you guess what this is and where it is located? You can see it from the street in downtown Traverse City, but you need to be looking down! Did you figure it out? 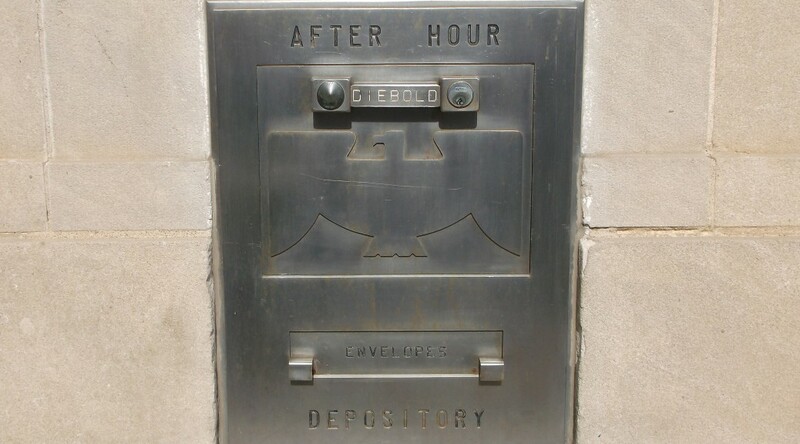 It’s the after-hours deposit box of the old Northwestern Savings Bank on Cass and Front Street, facing Cass. Although the building is no longer a bank, we appreciate that this relic was left intact! Thanks to reader Julie of Traverse City for providing the answer! I am a member of a tiny group of history buffs entitled—we think amusingly—the Backspacers. We occupy seats in a local coffee place for hours at a time, fueling our discussion of old buildings, old people, and old ways of doing things with plenty of pie and coffee. While we have enjoyed long residencies in the Traverse area, none of us was born here. For this we suffer the unspoken scorn of those few families that boast two or three generations in Northern Michigan. That, however, does not raise our hackles in the least: we accept our short-termer status with grace. One of the traits of us Backspacers is a pronounced tendency to linger over everyday things that express a connection to the past. Long have we marveled at manhole covers with the writing “Citizens Telephone Company,” at the blockhouse just under the Union Street dam that was said to hold money for workers in the Flour Mill located there, at the faded printing on a landmark building declaring it to be the “Traverse City Gas Company,” at Civil Defense bomb shelter signs, at the evidence of fire that nearly consumed the Wilson Antiques building. One of us—me, actually—spent time looking for cinders along Railroad Street, a curving road that paralleled tracks that accommodated coal-burning steam locomotives. For Backspacers automobile travel can be hazardous. Rapid stops occur as one or the other of us abruptly notices something out of time: an artesian well, an old home designed by a local architect more than a hundred years ago, the site of an old sawmill, or highway signs that suggest something misplaced in time. In particular, those signs, yellow with black icons, fill me with joy. Take note of the warning sign advertising the presence of a fire station, found on Veterans Drive and elsewhere, no doubt. Is it not comical—the silhouette of a 1930’s fire engine complete with helmeted driver? 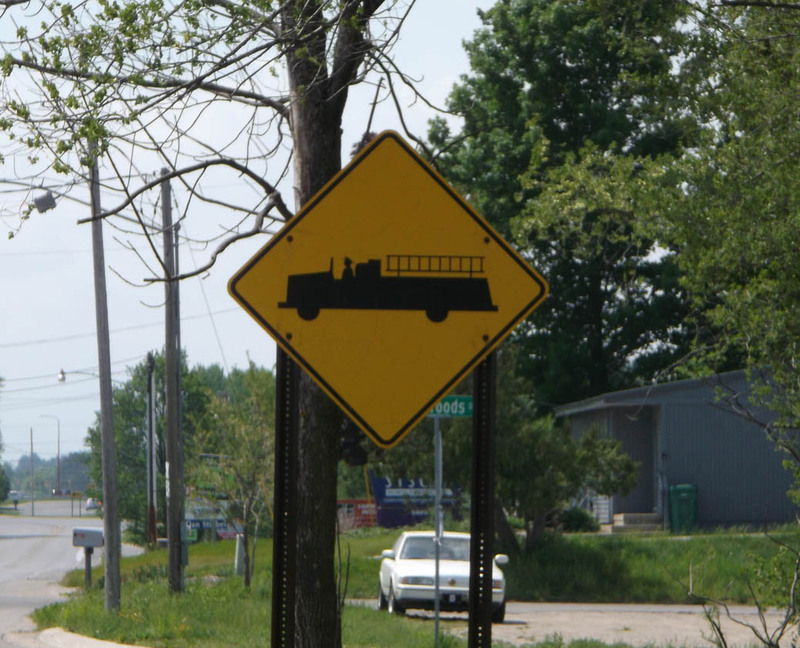 How well it communicates “fire truck” with the ladder clearly hanging from the side of the truck. No modern fire truck could substitute since most of them could be confused with any delivery truck in profile. Still, you wonder how long we will keep an icon that resembles artwork from a children’s storybook. A long time, this Backspacer hopes. 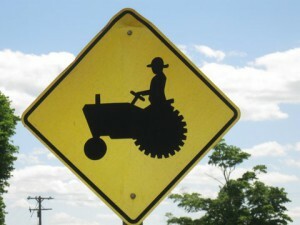 The sign for “Farm Equipment” portrays a stereotypical view of the farmer. 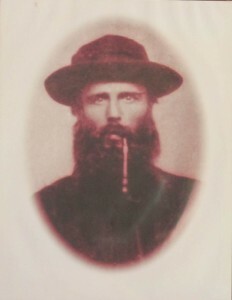 An individual with a wide-brimmed hat sits on a primitive tractor, the stalk of grass clamped in his jaws apparently too small to be stenciled. A modern fancy tractor with its enclosed air-conditioned cab is not pictured—since it lacks the clear connections among man, machine, and farming. 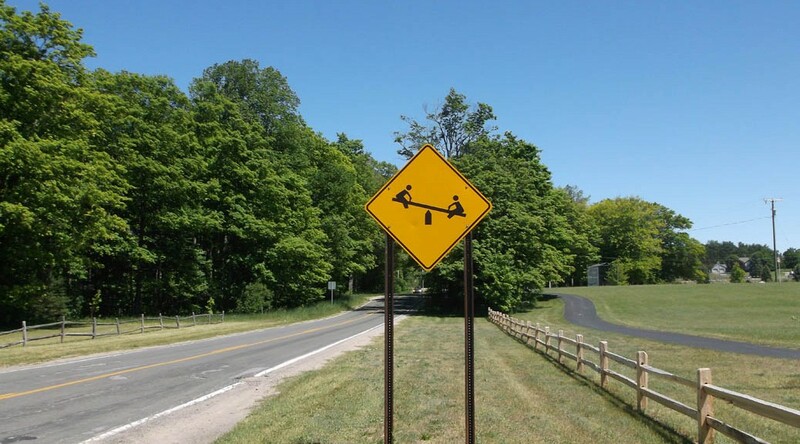 “Cattle Crossing” signs—the animals artfully represented–similarly urge caution in rural communities. The sign for “Playground” is equally charming: it shows two children on a teeter totter. Oddly, teeter totters have been banned from modern playgrounds upon the discovery that they have injured large numbers of children. Still, the image keeps the thing alive—at least for us adults—though young children have no idea what a real teeter totter looks like. 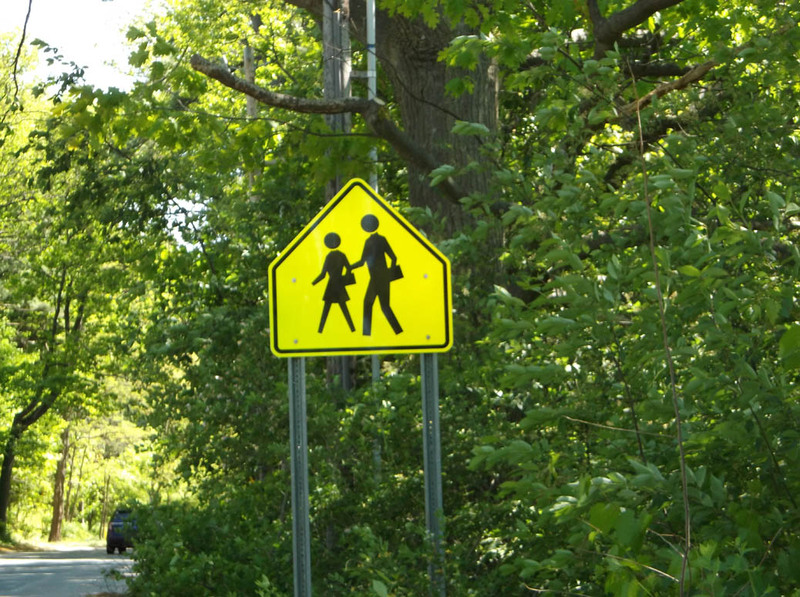 Another sign indicating children at play shows a boy (presumably) in shorts running carefree, possibly across the roadway. He wears a curious conical hat, something I have never seen on a boy’s head. 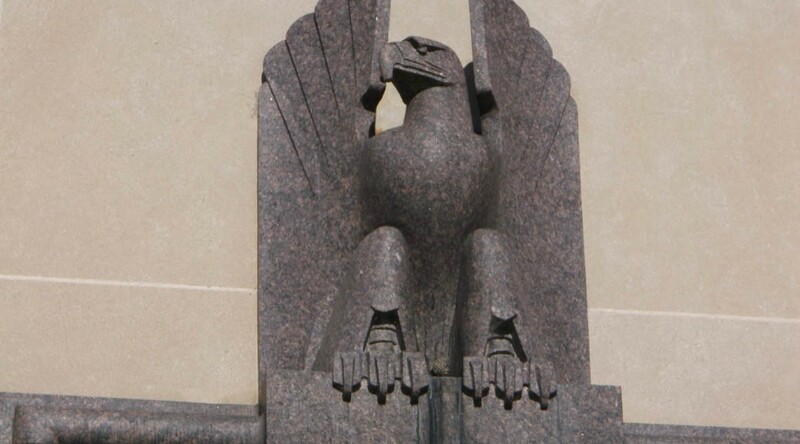 Does it indicate archaic style or a figure from a foreign land? 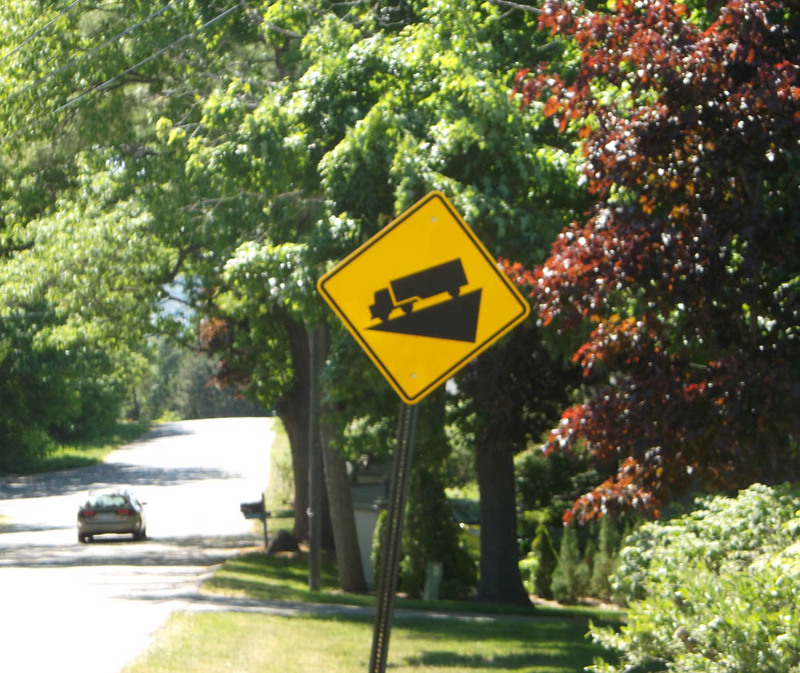 The image of a truck heading down a steep incline denotes a steep hill ahead, but the six-wheeler pictured and the admonition “Use Second Gear” seems out of place and time since it implies a manual transmission with three forward gears. 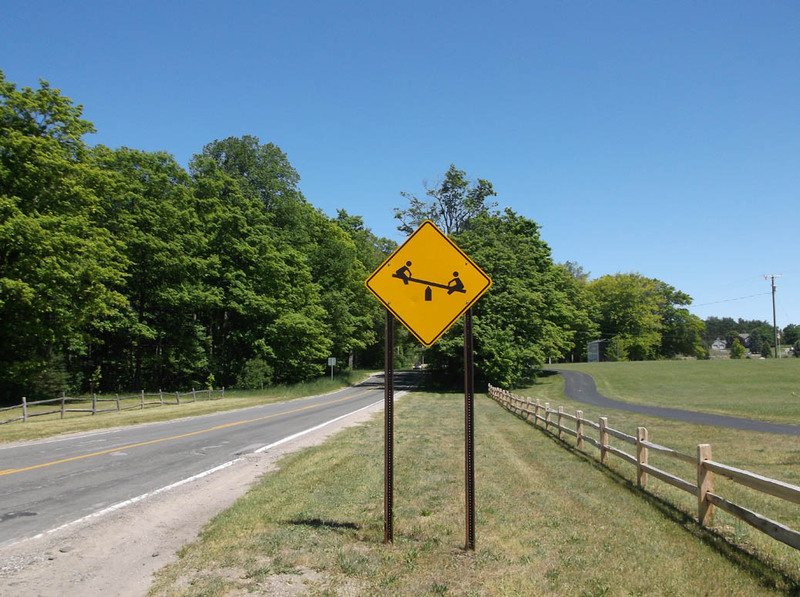 You can find such a sign on Leelanau County Road 616. Of course, all of us old timers remember the installation of the “Runaway Truck Ramp” on M72 leading down to the Bay. Some of us recall the small truck that wound up in the Bay before that salvation was constructed—was it in the seventies? Pedestrian crossing images tell us something about our society. The crossing sign near a school shows a larger figure, wearing pants, with his hand on a smaller figure wearing a skirt. Hazarding a guess about the gender of the figures—and nowadays this is only a guess not a firm conclusion—a man or boy seems to be walking with his hand upon the girl’s arm. To me this suggests he is protecting her as she braves traffic in the crosswalk. Could we have the larger figure wearing the skirt with her hand on the boy? After all, it is just as likely an older sister is guiding her rambunctious younger brother across the street. But, no—it is the way it is. Boys protect girls, not the other way around. Then there are the wonderful depictions of animals. In particular, the antlered icon rearing on its hind legs says “Deer” so boldly no one could miss it. Often sharpshooters are unable to miss them, too, as they pepper them with indentations with their deer rifles, perhaps in frustration at never hitting the real thing. Bear crossing signs appear nearby, too, near Cadillac along highway M115, for one. The mother bear and her cub are shown, providing gender equality to the buck shown on the deer sign. Backspacers are not content to note the existence of relics. They must do research to find out more. Are the signs of Michigan recognized in other states? In other countries? Exactly when were they created and who does the creating? The web provides us with a few answers: The United States Department of Transportation Federal Highway Administration sets the standards for traffic signs. It publishes the official manual for signing, the Manual on Uniform Traffic Control Devices (MUTCD). The manual has been constantly updated from its beginnings in 1935, the latest issued in 2009. The 1971 edition expanded the kinds and numbers of signs considerably. 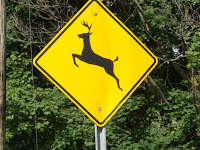 An effort was made to bring signs from various nations into conformity, telling us that the rearing deer beloved of Backspacers and most Americans can be seen in countries that deer inhabit. The figure for Japan, though, faces the opposite direction from its American counterpart since Japanese drive on the left side of the road. Perhaps the antiquated fire truck pictured on our signs represents those still in operation in less wealthy lands. The history of standard sign usage goes back to the beginning of automobile travel. 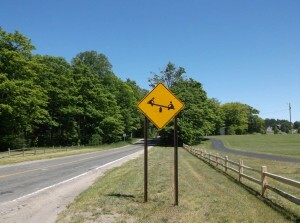 In the first and second decades of the twentieth century there were no standard signs across the United States. Signs could be any shape, any color, any size—with varying print fonts, messages, and iconic pictures. In 1927 the Joint Board (a precursor to the MUTCD) published the specifications for the signage we use today. Warning signs were to be yellow with black print in the shape of a diamond. The standard shapes and colors for railroad crossings (round), stop signs (octagonal), and informational signs (rectangular) were spelled out in the report. All at once highway signage had become clear, modern, and universal. 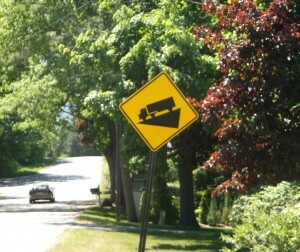 Yellow warning signs have proliferated over the last seventy years, indicating greater sensibility of automobile drivers to their driving environment. How else to explain “Deaf Child Area”, Moose Crossing, or even an image of a mother duck with her ducklings trailing after—presumably a “Duck Crossing” warning? We Backspacers hope these images will never disappear even as we proceed into an age without teeter totters and fire trucks without ladders. Without pretension, they provide windows to our not-so-distant past. Hannah St. Mary’s has a story no one besides a few select people know. This is that story. 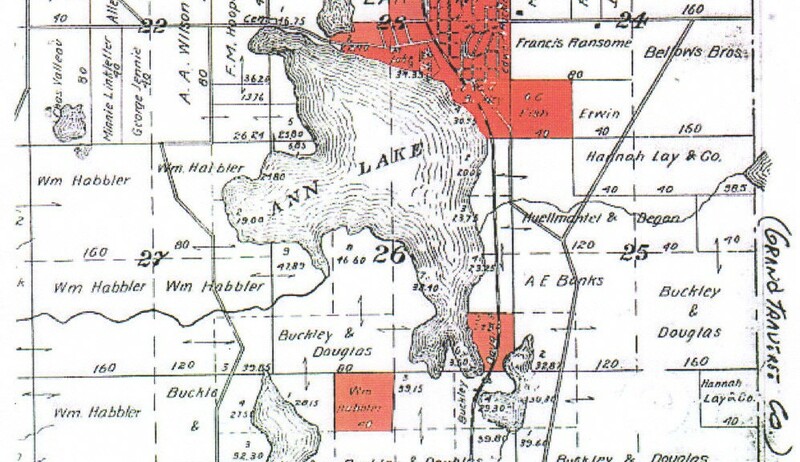 It all started when the first settlers came to Hannah. Around 1850 Perry Hannah, A.T. Lay, and James Morgan came and bought a sawmill along the Boardman River and started a business. Then in 1857 Congress passed a grant allowing funds to build a railroad in Michigan from Grand Rapids to Traverse Bay. 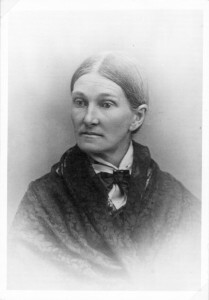 In 1862, George Nickerson and his family came and urged other families to join them. In 1872, with the railroad finally finished, settlers came from all over for the cheap land and the plentiful amount of timber. 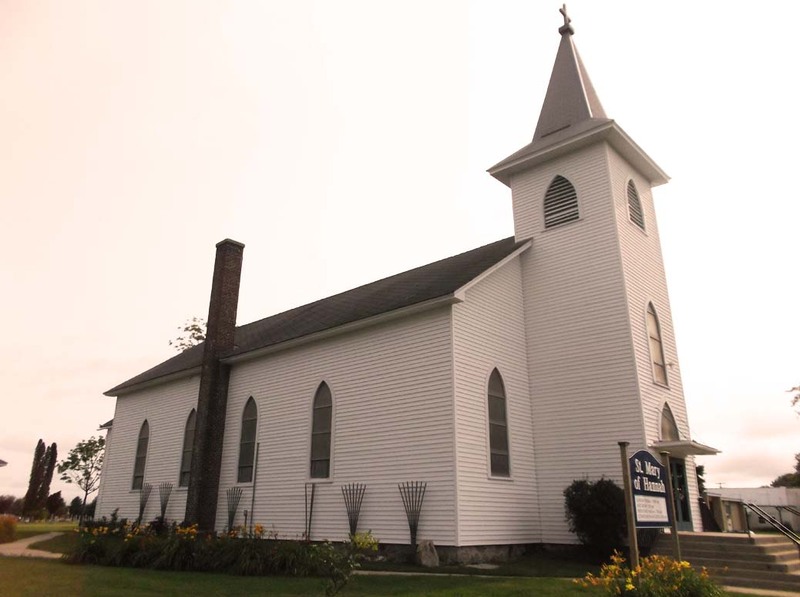 Later, after the railroad was built, they decided that they needed a church, building and completing it in 1885. However, the church did not have any altar fixtures in it until around 1896 when they bought their altar. It cost $81.84. It probably does not seem like much to us, but back then it was a large sum of money. This is the account told to me by Eugene and Jim Johnson. In 1982 on Easter Sunday Eugene Johnson took his eight-year-old son Jim fishing on Fish Lake. It was a slightly chilly, foggy day but you could still fish. They also took Jims’ metal detector to fiddle around with later. At long last, after continually failing to tempt the fish to bite, they pulled out the metal detector. They started in the parking lot, just finding small things such as pennies and other small coins. But as time passed, they wandered on down into the more swampy area of the woods past the campground, and over a bank when suddenly the metal detector was almost off the scale. When they looked down they saw something that resembled metal. They set the detector down and gently started digging. Soon they discovered that the first piece of metal was the base of a tarnished candlestick. They kept digging as the fog danced around them. Soon Jim found a potato sack; When it finally left its grave, it was revealed that it was chock-full of more candlesticks and vessels. As they dug even deeper, they started uncovering more candelabras–and discovered the piece that explained what all the others were, a large cross. Exterior of St. Mary of Hannah in 2014, a Catholic church in Grand Traverse County, south of Chum’s Corners and west of Kingsley on M1-13. Photo credit to GTJ editors. Eugene, once having been an altar boy, recognized the cross as one that might grace an altar. The question was where had these treasures come from? Eugene had never heard of a robbery of a church in the area. But they couldn’t just leave these gorgeous treasures alone could they? They did just that. After explaining their predicament once again, Father Murphy agreed that the artifacts were in fact like the ones put on a Catholic Church altar. However, while the tarnished silver artifacts were found, none of the gold artifacts that would grace an altar were found. Father Murphy suggested that he take the items in question and in the meantime he would look through old church files and see if he could find out the story behind the artifacts. Later that day or the next, Father Murphy called up Eugene and said, “Have I got a story for you.” He then proceeded to tell them that in the late 1800s or early 1900s the Hannah St. Mary’s Church had been robbed on horseback. The number of bandits and who they were are an unsolved mystery to this day. Pretty amazing story huh? Sadly the story never reached the news. The artifacts were put on display in the church rectory; Diane Gray, a Church secretary, remembers seeing some tarnished altar pieces in the office. However, today they are probably stuck in some dusty boxes, shoved into an even dustier basement where their history will never see the light. I am sorry to say that though many questions have been asked, no one can remember this story and that has made it hard to gather facts, though I am ecstatic that, due to research questions, more people know this fascinating story. I have spent several hours at the Traverse Area District Library looking at newspapers but have not found any mention of the robbery of any churches except for an attempted robbery of the St. Francis church in 1905. I did discover that the early history of the town was filled with robberies and murders. 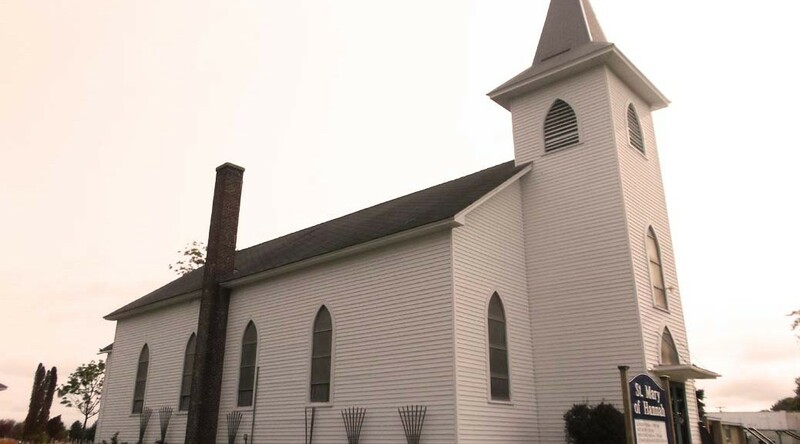 I spent quite a bit of time talking to members of the church whose families belonged to the church for a long time such as Margret Lewis, Messrs. Ray and Jay Weber and former parish secretaries such as Diane Gray and Terry Javin. I also spoke with Sue Zenner the daughter of Julia Harrand who wrote a book on the history of Hannah St. Mary, and interviewed Eugene and Jim Johnson who were the ones who found the treasure. Hannah Carr is a student at Kingsley Area Schools, who is passionate about writing and research, although she prefers writing mysteries to nonfiction. 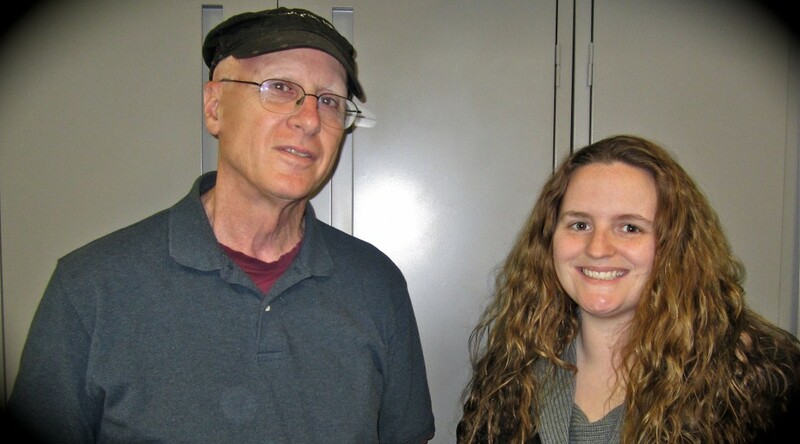 Carr was one of the winners of the 2014 Floyd Milton Webster Prize for History (Kingsley), Young Adults, for this article. She plans to be responsible with her Prize winnings, and the Editors look forward to her entry next year. Before the Traverse City Film Festival, before the Cherry Festival, Traverse City held a celebration of its own, a festival that carried no overtones of patriotism or commercialism. Participants were invited to bring their own picnic goodies to the Civic Center (then called the Driving Park) for a day of fun. Farmers came with their families, and city folk, too. The rich and poor mingled. Young and old. Factory workers and their bosses. Estimates of the crowd varied between 8,000 and 10,000 people. They ate and they partied. There were day fireworks and paper balloons launched for children, a bowery dance (a dance held outside) for the young, and the culminating baseball game for all who cared for that sport. In 1911—but not in 1912, the final year of Traverse City Day—speeches were offered to the crowd. One of them stands out because of its relevance to today’s social climate. Here are the words of the Record-Eagle in describing it. Judge A. L. Deuel, member of the executive board of the Western Michigan Development Bureau, was the next speaker. Introduced by Mr. Amiotte. He had many good things to say and he said them in a manner that impressed his hearers with the fact that he knew what he was talking about. Mr. Deuel is full of vim and fire and his address had a tendency in showing the farmers and the city people as well what it means not to patronize home industries. “Traverse City is a live city, a beautiful city,” he said, “and she is becoming more beautiful every year. If we could go through a Rip Van Winkle sleep of twenty years and awake to find the great Grand Traverse region, we would be astounded at the great growth. All this is taking place just the same only we are not asleep and the development is taking place so fast that we don’t realize it. If any of you farmers or city people either, are sending to Sears & Roebuck or any other mail order house for goods, cut it out. The home trade is what we need to help pay our taxes, and Sears Roebuck will never help you. They wouldn’t know you if you went into their store. They don’t care, all they want is your money. We are now living in the best age of the world. What are you doing for your community? Work together for your county, your township, and do your best always. No man can do more than his best, and when you have done that the duty of man to his country is fulfilled. This concluded the program and everybody flocked to the diamond to see the great battle of baseball, the feature attraction of the day.